The gardeners have many years of experience in delivering first class maintenance and amazing transformations to green spaces. Over the years we have been taking regular care of small private gardens and big public parks, always delivering the high standard customer service our clients have learned to expect from us. We have the necessary equipment to turn every green space into an oasis. Our garden maintenance Harrow HA services offer a prefect balance of affordable prices and amazing results. We offer a wide variety of garden maintenance in Harrow HA services our customers can choose from. No matter if you need help with the regular lawn mowing or hedge trimming, or require something more demanding and time consuming like a lake construction, we will come fully equipped to deliver the service you have booked. You will be able to see your garden transform before your eyes, at a price that is hard to beat. We also provide and other services in nearby areas including: West Harrow HA1, Headstone South HA2, Headstone HA2, Northwick Park HA1, Harrow Weald HA3, Kenton West HA3, Kenton HA3, Pinner HA4. You can choose any of the services listed above on their own, or combine a few of them to have your garden taken care for to the smallest detail. And when combining two or more of our gardening service together, along with great looking green space you will be able to take advantage of the special deals the gardeners Harrow HA offer. We deliver our garden maintenance with as little disturbance as possible to your daily routine. Just choose a day and time and we'll be there. Plus there are no additional charges for weekends and evenings. And if you want to read some feedback from our clients, just visit our testimonials page. 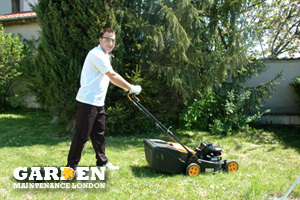 To book a service, delivered by the skilled Harrow HA gardeners, call 020 3404 5176 now! We have a team of friendly call centre operators expecting your call around the clock to offer you help with the booking process and free quotes. You can also contact us via our online chat support feature or schedule landscape maintenance through our request a service form.